Increasing instances of buildings catching fire can result into unwanted accidents and injure residents and employees. To prevent such occurrence of such accidents, individuals are spending on fire and smoke detecting systems. As smoke alarms detect the smoke or fire in the residential and commercial premises, customers can take precautions and evacuate the building to avoid accidents. In addition, smoke alarms transmits early signals to alert individuals of smoke detected. However, the conventional smoke alarms tend to detect smoke and transmit false alarms. Due to these factors, individuals need to check and ensure the source of smoke themselves. In order to improve customer experience, leading manufacturers are focusing on incorporating smart and innovative features such as multiple protect and WiFi for effective smoke alarms. On account of these factors, the global smoke detector market is expected to witness a steady CAGR, accounting for a value of over US$ 2,100 Mn by the end of 2026. Of various industries, demand for smoke alarms continues to remain high in the residential industry. Building surveyors are ensuring allocation of inter-connected smoke detectors in the buildings to ensure safety of the residents. As the kitchen area is more prone to fire accidents, architects and constructors are accommodating their designs for smoke alarms. To ensure safety of the residents, major manufacturers are focusing on developing photoelectric smoke alarms as they quickly detect smoke from the burning furnishings and fabrics, and respond fast to smoldering fire accidents. In addition, manufacturers are concentrating on incorporating optical photoelectric sensing chambers to quickly detect smoke and facilitate emergency calls. Demand for smoke detectors will remain concentrated in the residential industry to alert the residents and offer protection to the infants and old aged residents. Unlike in the residential industry, fire accidents are unpredictable in the commercial areas. Fire accidents in the entertainment avenues such as theaters and cinemas, restaurants, warehouses, and other commercial buildings can injure people and result in unaccounted losses. With the growing need for quick fire accident alerts, leading manufacturers are developing smoke detectors equipped with advanced features. Manufacturers are integrating features such as ionization alarms and VESDAs (Very Early Smoke Detection Apparatus) that offers monitored smoke detection features to the end users. VESDAs are mainly installed in the commercial areas such as entertainment avenues and retail complexes that accommodate large number of people. In addition, manufacturers are also equipping innovative features that trigger the suppression system on detecting smoke or spread of fire in the premises. Occurrence of undetected and unpredictable fire accidents in the healthcare institutions can result in chaos as the care takers need to evacuate the buildings and protect patients quickly. Growing need to ensure safety of the occupants in various healthcare institutions has led to a surge in demand for the smoke detection systems. Installing smoke detection system alerts the healthcare occupants, care takers, and doctors in advance reducing the reaction time and facilitating quick evacuation process. In order to offer better convenience, manufacturers are equipping smart features such as photoelectric split-spectrum sensor and IoT in the smoke detection systems. Integration of features such as IoT and WiFi facilitate interconnectedness in the smoke detectors and notifies the occupants and residents in advance to avoid any accidents. Leading players operating in the global smoke detector market include Hochiki Corporation, Honeywell International, United Technologies Corporation, Tyco, Siemens AG, Johnson Control, Robert Bosch, NEC Corporation, Nest labs, Schneider Electric, and Others. Transparency Market Research (TMR) offers valuable insights on the global smoke detector market in its recent report, and perspectives on major factors that are influencing the market growth. The market has been analyzed for the period of 2017-2026, with an in-depth assessment of the growth patterns traced in the global market. The market has been analyzed on the basis of segments and regions. 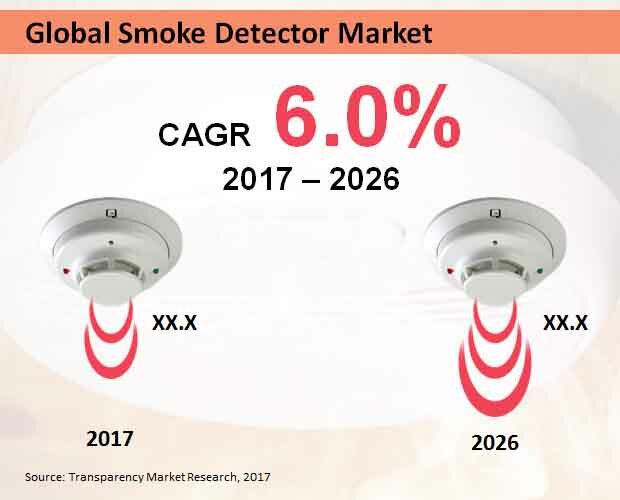 Crucial information offered in the overview of the report discusses the current market scenario and offers perspectives on the future growth prospects of the global smoke detector market. The report discusses drivers, trends, and restraints that will impact the growth of the segments and global market. In addition to the key factors that influencing growth of the market, the report offers insights on the pricing analysis, distributor, cost structure, and suppliers. Also, the report comprises a comprehensive summary pertaining to the current market opportunities and trends in the global market. Overview of the report also offers in-depth insights related to the qualitative analysis on the recent trends and drivers influencing growth of the global market. On the account of detailed information offered in the overview of the report, manufacturers, distributors, and suppliers can formulate informed strategies. Trade journals and leading magazines can also benefit from valuable information offered in this section of the report. This section of the report offers detailed insights pertaining to the leading players operating in the global smoke detector market. In the competitive landscape, the report offers crucial information and perspectives on company overviews, key strategies adopted by the market players, leading players, company sizes, and established players. Competitive landscape of the report also highlights the impact of collaboration and strategic acquisitions undertaken by the major market players. Valuable insights pertaining to the market strategies of key players can benefit the readers and clients in understanding the impact of collaborations, acquisitions, and product launches on the growth of global smoke detector market. On the basis of the crucial information offered in this section of the report, clients can develop effective business strategies. Valuable insights offered in this report are based on primary and secondary research. Company press releases, industry databases, interviews, and investor briefings with the experts and influencers have been taken into account to arrive at predictions and conclusions. The report offers quantitative analysis, which is derived through robust research methodology. Crucial information offered in the report are compiled in a manner that can benefit the readers and client to attain an in-depth understanding of the global market. Perspectives offered in the report can benefit the clients and readers across various industries. With the detailed insights offered in the report, new entrants in the global market can attain a better understanding of the current market scenario, whereas existing players can update themselves with the recent trends and develop effective strategies. Overall, the valuable insights offered in the report can serve as a pragmatic source of information for clients, leading players, readers, and investors for making informed decisions and strategies.